Promotional Chocolate Coins logo printed branded gifts. 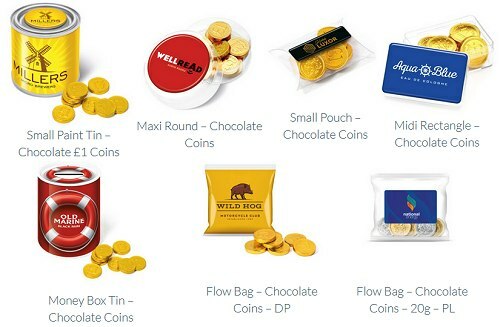 Here's our selection Promotional Chocolate Coins with logo printed wrappers and container lids for promotional gifts. The coins are delicious discs of milk chocolate that are stamped with £1. They are available in gold and silver foil and you can have them mixed. Chocolate Coins are available in these logo printed containers: Organza Bag · Money Box Tin · Flow Bag Printed Lable · Flow Bag Digital Print · Carousel Tin · Small Paint Tin · Large Pouch · Small Pouch · Midi Rectangle · Maxi Rectangle · Maxi Round Pot. We show details for seven of those and you can see the others at the bottom of the page. So if you want more details on those please ask Crazy Dave. We have more products than shown above. Please ask Crazy Dave about these Chocolate Coins container options.